00:55:00 Makes 6 servings, 1 cup (250 mL) each. 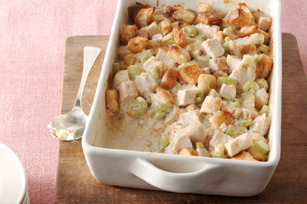 A delicious way to use up your leftover chicken - simply mix and bake! Spoon into 2-L casserole dish. Serve with a mixed green salad and a piece of your favourite fruit for dessert. Top casserole with 1/4 cup chopped toasted slivered almonds or walnuts before baking.